Although not addressed directly in Charlotte Mason’s original Homeschooling Series, picture study for older students is just as valuable as for our younger ones. Through consistent observation and enjoyment of a variety of artists’ work in the younger years, some middle school and high school students are ready to take on a little more detailed and guided study of art work. Even if you have not been regular in your picture study, it is never too late to begin! Especially if you have an artistically gifted child or two, don’t neglect teaching picture study for your older students. So where do we fit it into our study? Here’s how we do it: we organize our research of artists and their work chronologically according to which unit in history we are studying. Charlotte Mason suggests studying six or so works of one artist during a term, and although we usually recommend following that tried and true pattern with younger children, with older ones we sometimes study more than one artist at a time. We suggest in our unit programs that you study one artist per unit, so you would study about nine artists every year. Charlotte’s primary goal was for students to experience art for themselves, not become experts on the artist or a particular piece of art. For older students, however, especially for students who are particularly interested in art, you might consider a more structured approach. This method is simplified from Edmund Burke Feldman’s method of evaluating art, commonly known to the art world as Feldman’s Method of Critiquing Art. You may use this as a guide in having your students study and write about art. Always remember you may tailor this to the level and interest of your students; you may want to choose just a few questions for your student to write about if it is the first time he has studied and/or written about artwork, or you may just use these questions as discussion prompts. If you decide to use this guide, it may help for you to talk through it a few times before you actually have your student create a written interpretation. If you choose to have him write, have him respond in paragraph form in complete sentences. State the name of the artist, the title of the piece, and, if you know it, its current location. This is Diego Velázquez’ Equestrian Portrait of King Philip IV, currently located in the Museo del Prado, Madrid. Describe the work to someone as if the person you were talking to could not see it. Stick to the facts, listing everything you see in the picture. Answers will differ here—if your student is new to this, please be positive about his or her answers. If needed, it is okay to ask questions to help him, such as, what do you notice about the background? What is in the foreground of the painting? What else do you notice in the painting other than the horse and rider? In the center of this picture is a man on horseback. They appear to be on a hill or on the side of a mountain, as you can see small trees in the background and one behind the man and horse. The man is dressed ornately and he is looking straight ahead; from the title of the painting he must be King Philip. The horse looks strong and he is standing on his hind legs. There is not a lot of light in the picture; it looks as if it is very early morning or late afternoon – or perhaps it is an overcast day. On the left hand corner of the painting it looks as if there is a open piece of paper that had been folded in half. The king looks strong, serious and determined. How are the elements of art (color, shape, line, texture, space) and the principles of design (balance, contrast, emphasis, movement/rhythm) used in this artwork? What colors did the artist use in this painting? Did the artist use color to lead you to look at some particular object in the painting? What do you notice about how the artist uses light in the picture? Do you see any kind of movement in the picture? What strong contrasts to you see in light and color in this picture? What do you notice about the artist’s choice of materials? What grabs your attention when you first look at the piece? In this portrait of King Philip IV of Spain, King Philip on his horse is obviously the most important part of the painting because he is painted so largely and in the middle. The horse is moving; he is standing on his hind legs. He looks spirited and powerful, but the King on his back looks even more powerful than the horse. The artist uses light to balance the king’s glistening armor with the horse’s glistening coat. King Philip looks very serious. All art is about something. It may be about light, color, the subject matter, or even a political statement of some kind. Some art is easy to figure out and some is more symbolic. What is the theme or subject of the work? What is the work about; what do you think it means? The King is painted high on a hill. Everything else is literally beneath him. He is confidently looking straight ahead, in control of his powerful and spirited horse, ready for whatever is ahead of him. His expression looks pensive and serious, rather than frivolous, for example—the kind of look you would want to see in your leader. (In fact, it was customary at this time to paint royals on horseback, which was a symbol of authority.) Perhaps the purpose of this painting was to help King Philip’s subjects to have confidence in him as a strong leader. 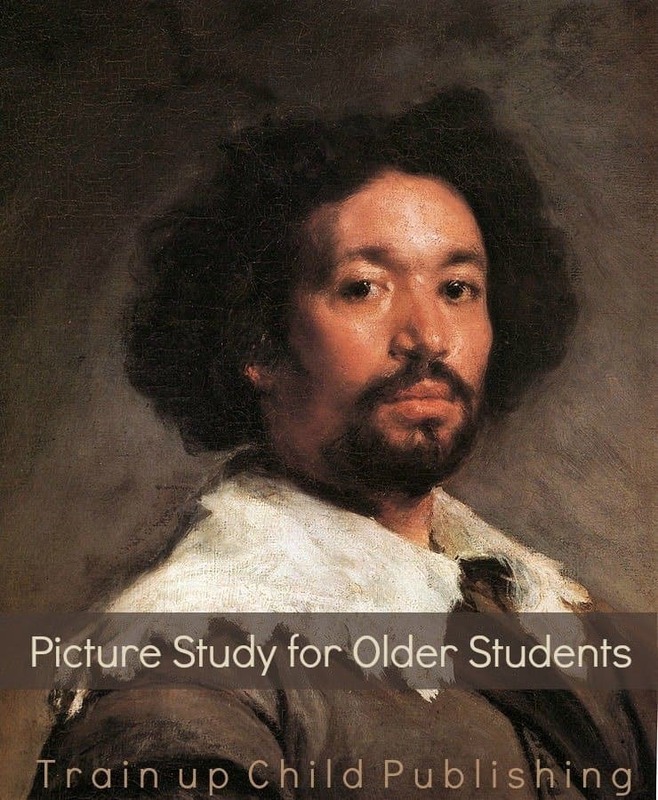 Do you do picture study for older students at your house? Would you like to start? Dana, I just pinned this and posted it to my blog’s FB page. Thanks so much! >? It is an EXCELLENT book that was a family favorite about the slave of the Spanish artist Velázquez. The first portrait at the top of this post is a portrait of that slave. Reading the book and then looking at that portrait made my kids see them as ‘real’ people – which is the whole point of our studies. 🙂 Thanks for commenting! Hi Jimmie! Sprite is fortunate to have a mom who is planning ahead. 🙂 Those years go awfully fast once children reach late elementary. Glad you enjoyed the post – thanks for taking the time to comment. Dana, This outline is very helpful. I want to print this out for future reference. 🙂 My daughter is in 5th grade, and we’re starting more indepth analysis. This is the direction I want to go — writing about academic subjects.